It was almost as if time stood still for a few minutes. As I walked out of Karama Centre in Karama, I noticed Asatullah. 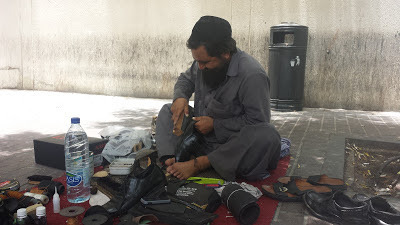 A cobbler by profession, he plys his trade right outside the rear entrance of Karama Centre. Amidst all the glitz and glamour of Dubai, here is the other side of Dubai. The old world charm still survives. 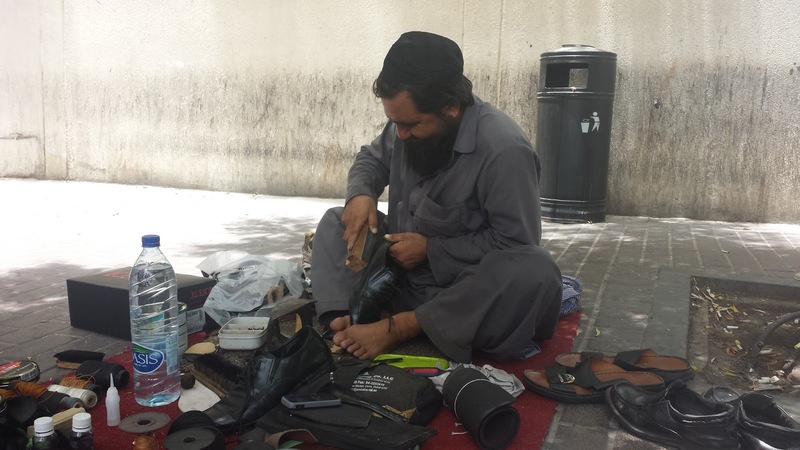 Asatullah is originally from Afghanistan but has moved his family to Pakistan. He claims to be in Dubai for about 15 years although he also mentions that this could be completely wrong and that he may be a resident of Dubai for much longer. There is something amazing about the way he goes on with his work with very little change in his tools over the years. He uses the most basic of tools and may have never seen the kind of tools which cobblers use today. If one were to observe the spot where he sits, you couldn’t help notice the businesses everywhere. Everybody seems to be in a tearing hurry to get things done. And yet when you sit with Asatullah, it’s almost as if time stands still. It is the old world charm of Dubai that we seem to have lost completely. Dubai scored yet another first and continues to take a leadership position in the global mobile devices business. 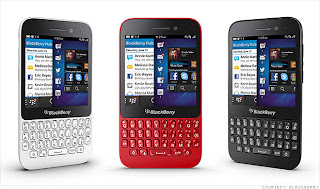 Blackberry laucnhed its latest introduction to its portfolio, the Blackberry Q5, at a global launch in Dubai today. Customers in Dubai will be able to buy the model 2 weeks before the rest of the world where the model is expected to launch in the first week of July. This is the first of Blackberry's BB10 offerings in the mid segment with the new model expected to retail at AED 1,499/-. Based on a dual core 1.5 GHz processor and Blackberry's popular keypad, a whole new segment of customers will now be able to experience the new BB10 operating system. The Blackberry Q5 is available exclusively at the new Blackberry store being opened at Dubai Mall. The launch of Blackberry Q5 also coincides with the opening of the first Blackberry store in the Middle East. As per media reports the store is being operated locally by Axiom Telecom. 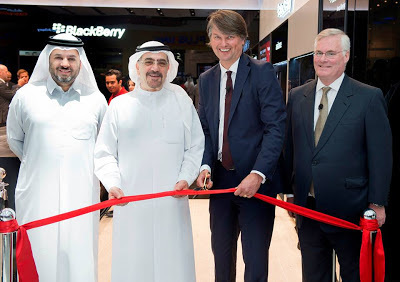 The store was opened by Blackberry's COO Christian Tear today. Huge queues were seen at the store in Dubai Mall, with customers all waiting to pick up the new Blackberry Q5 while it lasts.